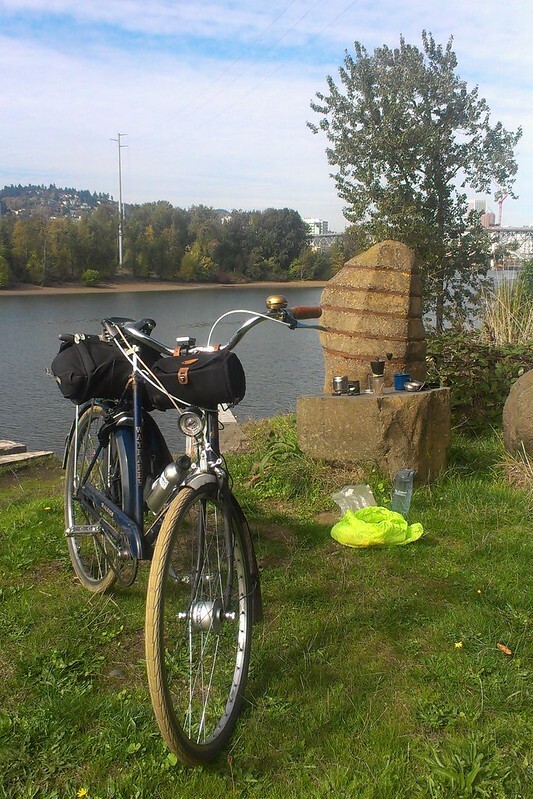 Have you heard about Coffeeneuring? You haven't? Well, it's an annual challenge put on by Mary over at Chasing Mailboxes D.C. Basically, to participate, one needs to ride a "coffee run" once a week for seven weeks consecutive. This coffee ride must be at least 2 miles in length, and you can't hit up the same coffee shop twice. There's some more rules in there, so you should just go check out the 411 here. This is the first year I'm participating. Normally you have to do the coffee ride on a weekend, but since I have a non-traditional schedule, I can do it on one of my days off during the week. 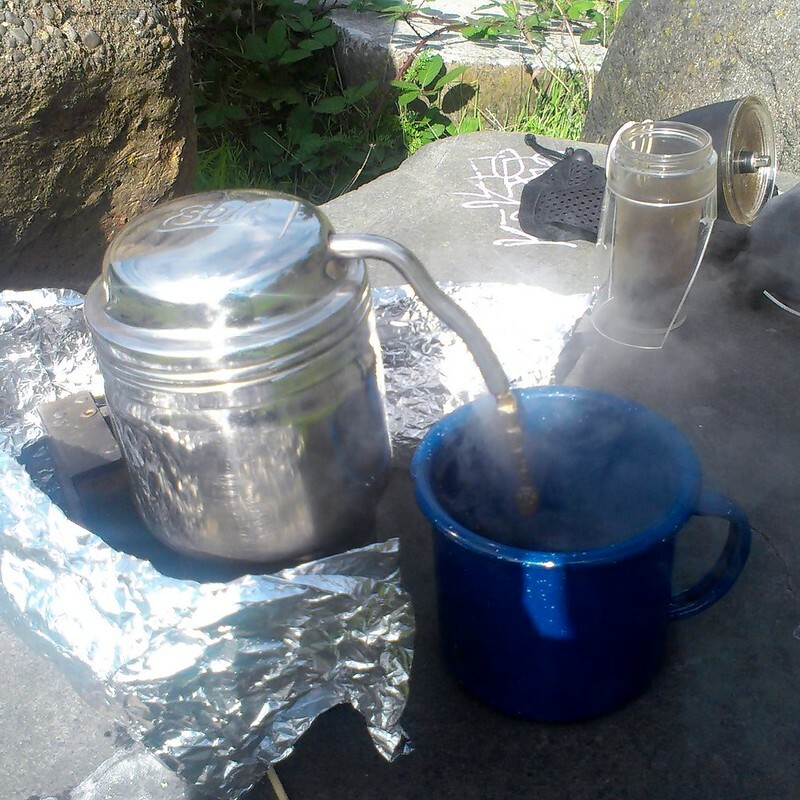 And normally one would have to ride to a brick-and-mortar cafe, but Mary created a "Cafe Without Walls" category aimed at those who might do their coffee ride on a camping trip or such. Or, just ride to somewhere outdoors and make coffee there. Now as you probably know Portland has no shortage of coffee shops (there are literally several dozen within a two mile radius of my house), and I will definitely hit up some of those during this challenge. 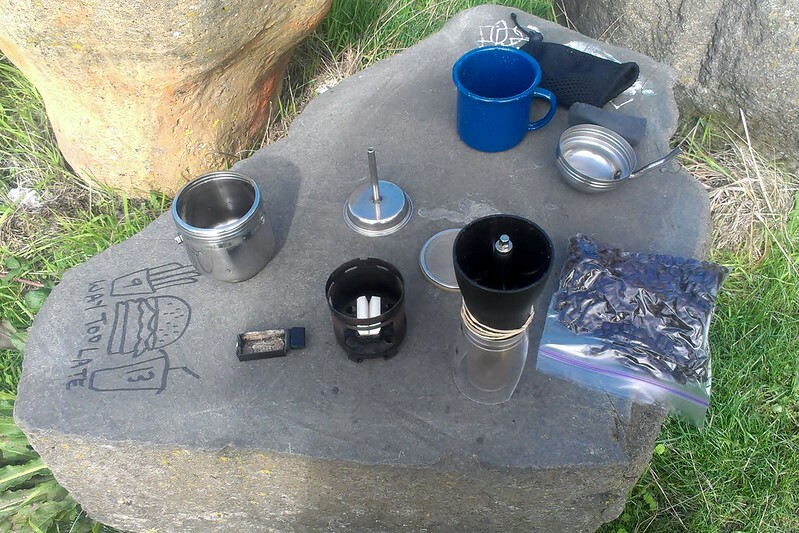 But while the weather is still nice, why not coffeeneur outdoors? Wednesday was a nice day, but a busy day for me, with some projects that needed completion. Still I readied up my trusty Raleigh Wayfarer three-speed for a journey down by the river, as not only would this be a Coffeeneuring Ride, but a Three-Speed Coffeeneuring Ride! (I thought I'd be the first one to do it, but apparently I am not.) It was a nice easy ride down to the Springwater Corridor. But then things got less easy. 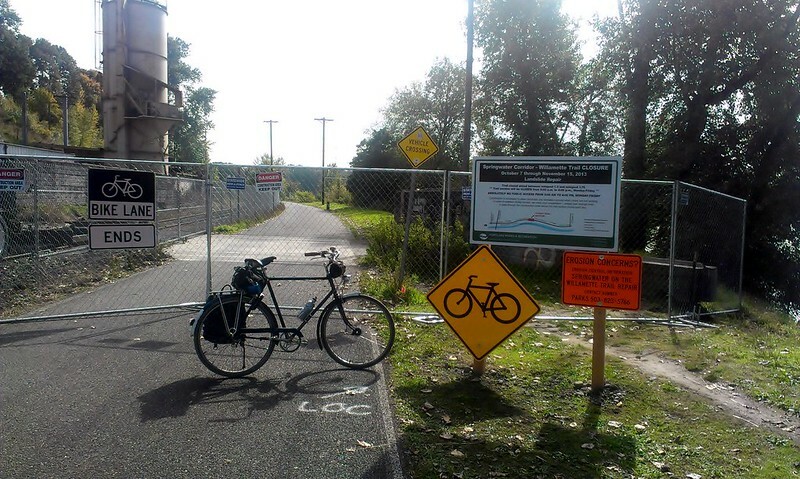 I hoped to ride down to the waterfront in Sellwood, but this barrier greeted me a mile in. I had forgotten about this construction project, alas. (It would have been nice if they put a more prominent "Trail Closed One Mile Ahead" sign at the main portal rather than the small-print "Project Details" sign that is currently there, but you sort of expect these things as a bicyclist.) I turned around and looked for another spot that I could set up. I found one atop the small knoll beside the path, one supposedly named "Dinosaur Rock". Atop the rock sat a smaller, flat rock, one that would be suitable as a platform for my operation. While grinding the coffee, this was the view that greeted me. 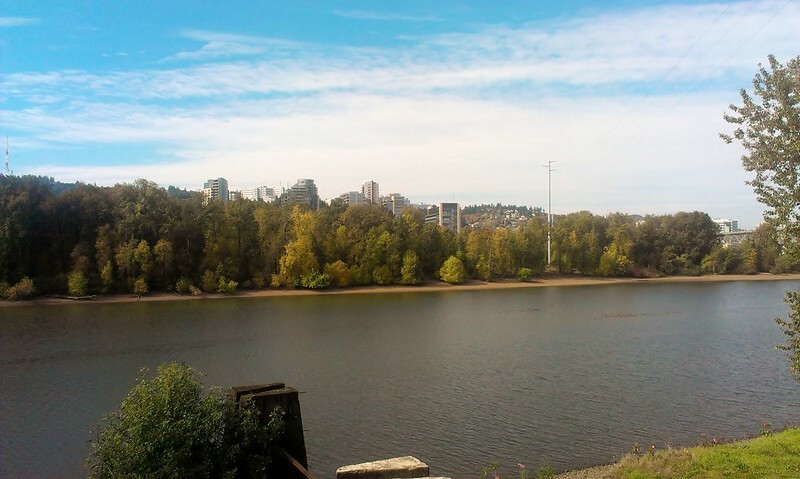 The glass tower development on the other side of the Willamette has been colloquially dubbed, "Little Dubai". After grinding, I realized that there may be some more issues that I didn't plan on. For one thing, it was a bit windier than I expected, and I had forgotten to take a windscreen. 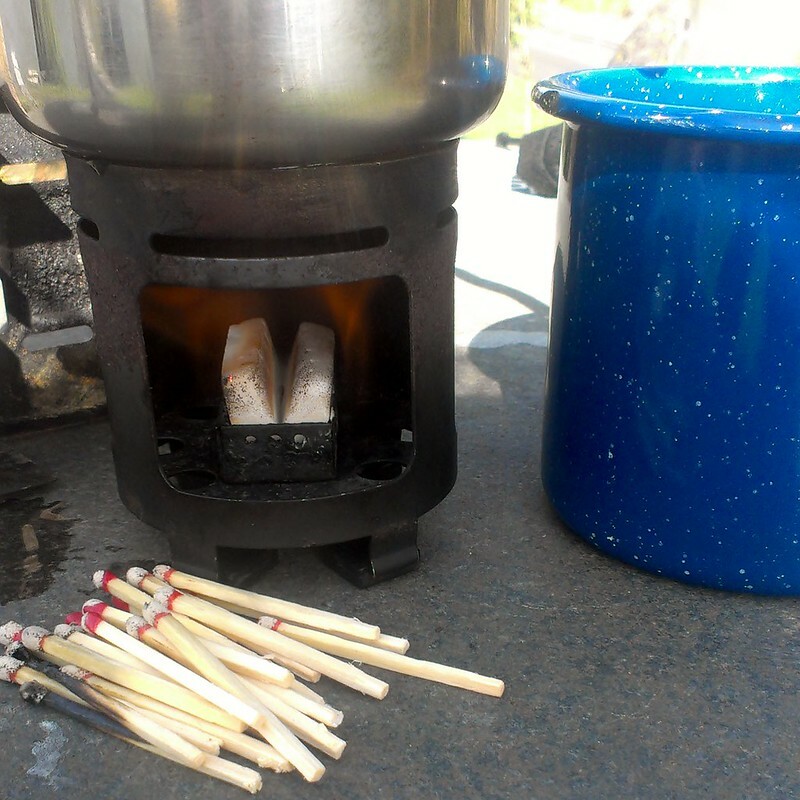 I fashioned one with the other Esbit stove and some aluminum foil from the slice of leftover pizza I was going to consume for lunch. But a larger problem arose. Every match I lit fizzled out in a fraction of a second. Every. Match. Was this a bad batch of matches, the wind, or both? Whatever it was, I lit match after match, as I didn't bring any other source of flame, determined not to give up until I tried every damn match. Finally after what was probably the twentieth match, one lit up and ignited the fuel tablet. The coffee making took longer than normal, most likely due to the wind. I had to stoke the flame with some additional fuel tablets. But after half an eternity, black gold spouted from the spout. I had coffee. Success. So there you go, my first of seven coffeeneuring adventures. 3.75 miles total. Maybe you'll attempt one of your own? Maybe on a three speed? I can't tell you how the coffee tasted, as I fear the lizard people would come after me. 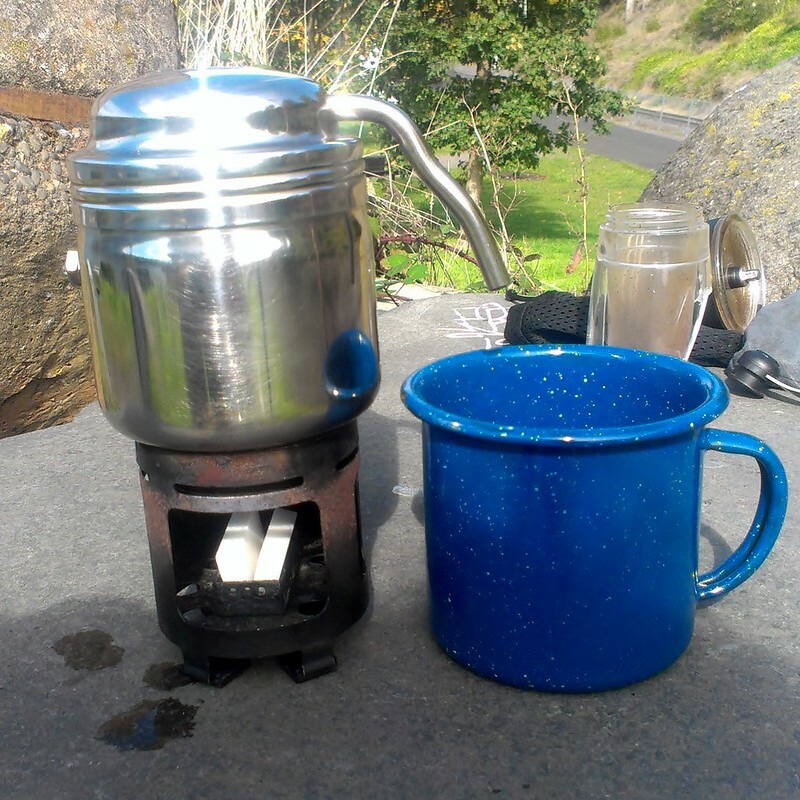 I am impressed with the tenacity of your outdoor coffee making. I also coffeeneured on a 3 speed, but just to the local coffee shops!